Fall stubble burning in the Red River Valley used to be as common as spring seeding. But smoke wafting into Winnipeg became such a health hazard in the late 1980s and early 1990s the Manitoba government began regulating crop residue burning in 1992. 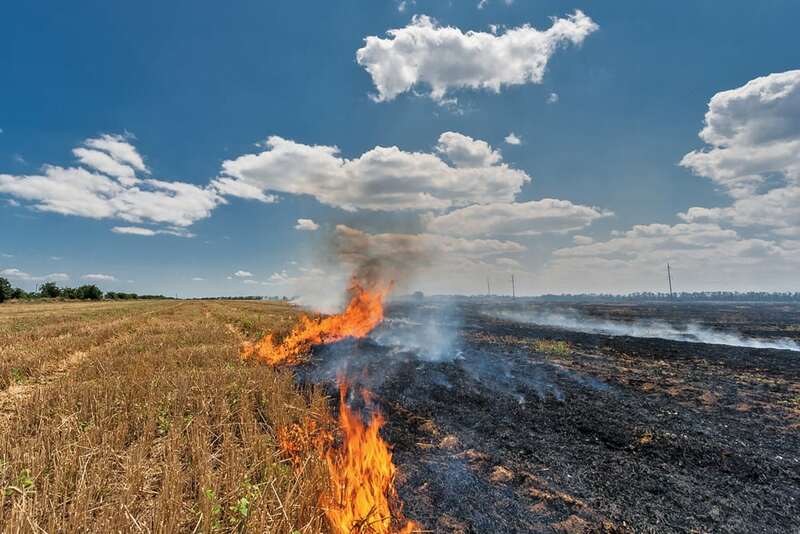 Now burning permit requests from farmers in the 10 rural municipalities near Winnipeg are down for the second consecutive year, says Brian Wilson, Manitoba Agriculture’s industry development specialist for water and environment. He cited a number of reasons in an interview Sept. 4, but an early harvest, dry weather and burning bans issued by a number of rural municipalities to prevent wildfires top the list. Hot temperatures and a lack of rain this growing season resulted in less straw production. And what was produced broke up, making it easier to work into the soil. Other factors include shorter-strawed wheat varieties, an increased demand for cereal straw for cattle feed, better straw chopping, chaff spreading, tillage and seeding equipment and increased plantings of lower-residue crops such as soybeans. “I think all those things combined have led to a lessening over the years in the amount of burning that happens,” Wilson said. But it hasn’t eliminated it and won’t. There was a fair bit of residue burning in 2015 and 2016, Wilson noted. A number of farmers dropped oat straw intending to bale it. It turned wet, the straw started to rot and couldn’t be baled. University of Manitoba soil scientist Don Flaten isn’t sure whether Manitoba farmers are burning less these days, but suspects that. “My guess is there probably is because of the other options that are available,” he said Sept. 5. Manitoba farmers planted an average of 848,064 acres of flax in the 1980s, according to Canada Grains Council data. Crop-insured flax plantings averaged just 342,200 acres the last five years, according to Manitoba Agricultural Services Corporation figures — a 147 per cent decrease. While weather drives the demand for burning, burning regulations presumably have reduced the amount of smoke and the negative health effects. When farmers do burn, the public, especially Winnipeggers, aren’t likely aware of it. 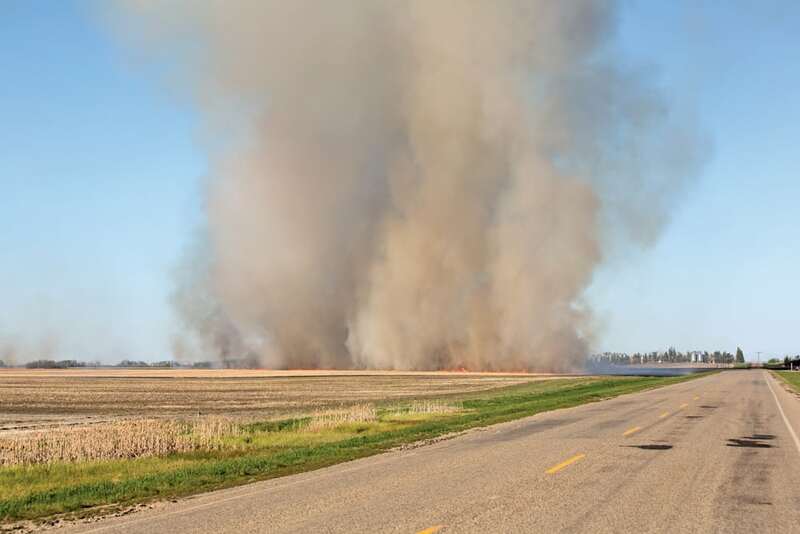 Manitoba’s Controlled Crop Residue Burning Program, which falls under the Department of Sustainable Development, but is administered by Manitoba Agriculture, is in place this year from Aug. 1 to Nov. 15, 2018. Farmers in the Rural Municipalities of Rosser, Headingley, St. François Xavier, Cartier, Macdonald, Ritchot, Taché, Springfield, East St. Paul and West St. Paul, require a burning permit. Between Aug. 1 and Nov. 15 no residue fires can be lit before 11 a.m. and there’s a year-round ban on all residue fires at night. For the rest of the province, daily authorizations are made by 11 a.m. Some days, burning will be authorized only by permit. The daily authorizations will state when burning can start, when fires must be out, and if a permit is required. Those who break the regulations could be fined. Information on Manitoba’s Controlled Crop Residue Burning Program is available online or by calling toll free 1-800-265-1233. The weather and location of a proposed fire are the biggest factors in deciding if a farmer can burn, Wilson said. “We actually have some models that look at smoke dispersion,” he said. “We look at how well the smoke is dispersing in the atmosphere and the wind direction. In the late 1980s there was pressure to ban all residue burning. A Manitoba Co-operator story from Sept. 3, 1987 headlined ‘Where there’s smoke, there’s ire,’ noted one day in late August Manitoba’s Environment Department received 60 calls complaining about stubble smoke. “Stubble burning is the single largest environmental complaint we get,” Tom Owen, the Environment Department’s then deputy minister said in an interview. Burning crop residue does reduce nutrients, but if restricted to windrows, the losses are less than some might think, Flaten said. “It’s a lot worse if you burn the whole field,” he said. Manitoba Agriculture soil management specialist Marla Riekman agrees. “The grain that’s leaving the field is the biggest nutrient bunch,” she said in an interview Sept. 7. “The residue that’s remaining has some nutrients left in it. Manitoba Agriculture’s website says three pounds of phosphorus and 32 pounds of potassium will also be lost. Burning also reduces the organic material going back into the soil, but not by a lot. “The issue is if you’re burning or baling (straw) every year, then there is a long-term organic material, long-term nutrient cycling that you are losing out on,” Riekman said. Riekman feels residue burning has decreased and credits improvements in equipment such as combine straw choppers and new tillage options. The heavy clay soils of the Red River Valley, especially when wet, make it difficult to break down crop residue, she said. “That’s typically why we saw so much burning,” Riekman said.